Australian street drummer Gordo. Photo Courtesy of: Gordo. Who needs drums when you can use buckets to create unique sounds and beats? 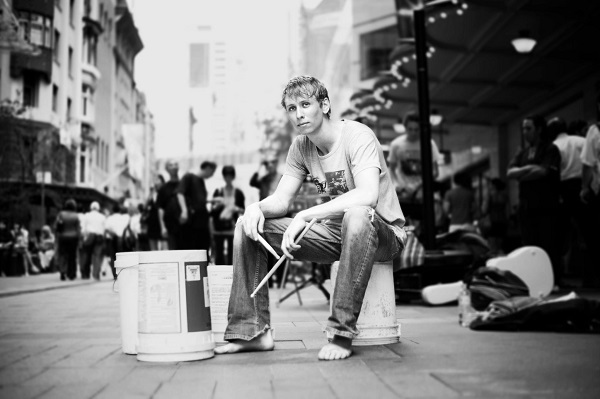 Australian street drummer Gordo, who had previously studied in Japan, knows a thing or two about making music out of everyday items and effortlessly stick twirling. Full of energy, passion and joviality, the Dubbo native can often be seen sitting surrounded by white buckets as he alternates his sounds using nothing more than a pair of drumsticks, the floor and his foot, much like his greatest influence, New York City busker Larry Wright. When he isn’t working with artists around the Sydney area or working parties and events, he can be found performing on the streets, bringing his talent to the masses, or teaching the basics via his YouTube channel. Check out the video below in which several spectators groove out to the beat of his drum (or should we say bucket? ), followed by a quick tutorial for those itching to try this at home. Video Courtesy of Gordo Drummer. For more videos of Gordo performing or his tutorials, be sure to visit his YouTube channel.